Every career has its defining moments. Not all of those moments are big or headline-grabbing. For Olson, who endured eight-and-a-half seasons in the minors before becoming an All-Star as a major-league rookie, several small moments defined his baseball career. The first one came when Olson was a freshman at the University of Minnesota. Olson, a three-sport standout at Edina-East High School who was recruited by colleges for both football and baseball, arrived on the University of Minnesota campus in the fall of 1979 as an infielder. The defining moment came on the first day of winter practice. “At the first practice of winter ball in the Fieldhouse,” said Olson, “[head coach] George Thomas and [assistant coach] John Anderson talked to me. Had he remained an infielder, Olson probably wouldn’t have played much for the Gophers as a freshman. “Third baseman Dave Francour was returning,” said Olson, who went on to hit .370—third on the team—for the 33-13 Gophers that finished second in the Big Ten. Another crucial moment for Olson came that spring and involved Minnesota media legend Sid Hartman. “Sid came out to practice and told me that [Gophers football coach] Joe Salem was going to come out and talk to me about playing football,” said Olson. In the fall of 1979—Olson’s freshman year at the University—the Gophers had three senior quarterbacks, including Mark Carlson and Wendell Avery. In practice in the spring of 1980, a junior being counted on to take over at starting quarterback got hurt. “I wasn’t highly recruited for football,” said Olson, who was born in Marshall, Minnesota, on September 6, 1960, and moved to Edina when he was eight years old. “I talked to Joe. He said, ‘We’re hurting and we don’t have a lot of depth.’ I said, ‘What the heck.’” Olson was on the 1980 team but did not letter; he then decided to give up football and concentrate on baseball.. While Olson’s college football career was brief and uneventful, it did have an impact on his baseball career. In the spring of 1981, Olson batted .391 with 39 runs batted in (RBIs) in 49 games to earn first-team All-Big-Ten honors. Olson helped lead the Gophers to the Big Ten West Division title (1981 was the first season of divisions in the Big Ten) and the championship game of the Big Ten playoffs. The Gophers advanced to National Collegiate Athletic Association (NCAA) play, where they lost to Florida State and Miami (and future major-leaguer Neal Heaton) in the South Regional. Olson’s junior season saw changes to the Gophers baseball program as Anderson, then 26, replaced Thomas to become the youngest head coach in Big Ten history. Late in the 1982 season—after losing three of four at home to Iowa—the Gophers appeared to be in danger of not making the Big Ten playoffs (the top two in each division advanced to the playoffs). Needing to win at least two of four games at Wisconsin, the Gophers lost the series opener before winning the next three games to finish second in their division (with an 8-8 record) and qualify for the playoffs. After losing the first game of the double-elimination tournament to Ohio State, the Gophers came back to win four consecutive games and the Big Ten title. The Gophers’ season ended when they went 1-2 at an NCAA regional in Stillwater, Oklahoma. Olson had again earned first-team All-Big-Ten honors after hitting .363 (.379 in Big Ten games). In three seasons with the Gophers, Olson had batted .375 (tied with Terry Steinbach for fourth-best—behind Mark Merila and future major leaguers Brent Gates and Robb Quinlan—on the school’s career list). His on-base percentage of .464 is tied for fifth-best in school history as of 2008. Olson was selected in the seventh round of the 1982 amateur draft by the New York Mets, whose Midwest scouting director was future Minnesota Twins general manager Terry Ryan. After signing, Olson began his pro career at Lynchburg (Virginia) of the Class A Carolina League, batting .264 in 32 games. Olson returned to Lynchburg in 1983, where he caught the Mets’ number-one draft choice in 1983—18-year old Dwight Gooden. Gooden, the fifth player selected in the 1983 amateur draft, went 19-4 with a 2.50 earned-run average (ERA). In 191 innings, he allowed just 121 hits and struck out a league-record 300. After the season Gooden was named the Class A Player of the Year by Baseball America. Another teammate was future major-leaguer Lenny Dykstra, who batted .358 with 188 hits and 105 stolen bases in 136 games. Lynchburg went 96-43 in the regular season and swept Winston-Salem, three games to none, in the league championship series. Olson’s ascent through the Mets minor-league system was gradual. He spent all of the 1984 and 1985 seasons and most of the 1986 season at Class AA Jackson. Late in the 1986 season, Olson was promoted to Class AAA Tidewater, where he hit .327 in 19 games. Olson spent all of 1987 (batting .283 in 47 games) and all of 1988 (.267 in 115 games) at Tidewater. Following the 1988 season, Olson signed with the Minnesota Twins as a six-year minor-league free agent. He went to spring training with the Twins in 1989 and had a good spring defensively but batted .211 in 11 games and lost the number-two job to Brian Harper, behind starter Tim Laudner. Olson began the season at Class AAA Portland and was recalled by the Twins on June 27 after Dan Gladden was placed on the disabled list. Olson made his major-league debut that day, when he entered the Twins’ home game against Oakland in the top of the eighth inning as a defensive replacement. In the bottom of the eighth, he grounded out to second off Bill Dawley in his first major-league at-bat. Four days later, Olson again entered a home game—against the Angels—in the eighth inning as a defensive replacement. In the bottom of the ninth, he singled off Bryan Harvey for his first major-league hit. After 15 days with the Twins, which included one more appearance as a defensive replacement, Olson was returned to Portland. He batted .235 in 79 games with the Beavers; when the major-league rosters expanded on September 1, the Twins did not recall him. 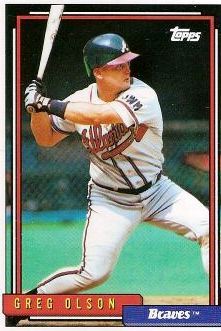 Following the 1989 season, Olson signed with the Atlanta Braves as a minor-league free agent and was invited to spring training in 1990 as a non-roster player. In April, there was another small, defining moment for Olson. Late in spring training, the Braves picked up 26-year-old catcher Phil Lombardi, who had appeared in 43 games with the Yankees and Mets over the previous four seasons. At the same time, the Braves also asked catcher John Russell to report to Richmond. He refused the assignment and became a free agent. Olson was joining the Braves as a 29-year-old rookie and the number-three catcher, behind Ernie Whitt and Jody Davis. At the start, Olson didn’t play much for the Braves. “Of the 27 guys on the roster, I was the last guy to see action,” said Olson, who finally made his Braves debut on April 22 in Cincinnati. After a start against the Phillies on April 27, Olson caught Glavine again on April 28. Several more starts catching Glavine ensued for Olson. Then, in mid-May, the Braves released Davis, who was hitting just .071. Between April 22 and May 17, Olson appeared in 16 games and batted .371 (13-for-35). He capped that stretch with two home runs and five RBIs in a 6-1 victory over Pittsburgh on May 17. In a 15-game, 18-day stretch between June 6 and June 24, Olson went 23-for-51 (.451) to raise his season average to .316. On June 12 in Cincinnati, Olson hit a grand slam in the Braves’ 8-3 victory over the Reds in the first game of a doubleheader. Olson’s reward came when he was selected to represent the Braves in the All-Star Game. Olson, two months shy of his 30th birthday, went 0-for-1 in the National League’s 2-0 loss to the American League at Wrigley Field. The Braves were 33-47 at the All-Star break and had changed managers on June 21 when Nixon was fired and replaced by Bobby Cox. John Schuerholz took over as general manager, and Leo Mazzone became the Braves’ pitching coach. Olson finished the season hitting .282 in 100 games. The Braves finished last in the National League West with a 65-97 record. The 1991 season would prove to be as memorable for Olson and the Braves. Olson went to spring training as the team’s number-one catcher, and, with young pitchers like Steve Avery, Glavine, and John Smoltz, the Braves showed dramatic improvement. The Braves heeded Bream and Pendleton’s advice, winning nine of their first 11 games after the break while the Dodgers were losing nine of their first 11. Down the stretch, Olson was a fixture in the Braves’ lineup. In a 32-game stretch between September 1 and October 5, Olson caught all but two innings. The Braves completed their last-to-first turnaround by winning the National League West with a 94-68 record, one game better than the runner-up Dodgers. In the National League Championship Series, the Braves met the Pittsburgh Pirates and Barry Bonds. In Game Three, Olson hit a two-run home run in the Braves’ 10-3 victory, which gave them a two-games-to-one lead in the series. The Pirates won the next two games to take a three-games-to-two lead in the series. In Game Six, Avery and Pittsburgh’s Doug Drabek, the National League Cy Young Award winner the previous season, locked up in a pitchers’ duel. After eight scoreless innings, Olson came to the plate with two out and Ron Gant at second base. Olson delivered a double that scored Gant with the game’s only run. The Braves won Game Seven 4-0 behind Smoltz to advance to the World Series. Their opponent—the Minnesota Twins—had also completed a worst-to-first transformation from 1990 to 1991. “Obviously, the 1991 World Series was a thrill,” said Olson. “Going against my hometown team. It doesn’t get any better than that”—especially when one considers that Olson contemplated going into the insurance business with his father and almost retired in 1990. The 1991 World Series is considered by many baseball experts to be one of the best in history. The Twins won the first two games in Minneapolis, before the Braves won the next three games in Atlanta. The Twins took the series by winning Games Six and Seven in Minneapolis. Five of the seven games were decided by one run. One of the most lasting memories from the series is a picture of a play at home plate in the third inning of Game One involving Olson and Dan Gladden. Olson did a backward somersault but hung onto the ball after tagging out Gladden. The 1992 season saw the Braves in another pennant race and eventually another World Series. Olson’s season, however, came to an early end. On September 18, he fractured his right fibula and dislocated his right ankle in a home-plate collision with Houston’s Ken Caminiti. “With one out [in the top of the fourth] there was a fly ball to [David] Justice in right,” said Olson. “Caminiti tagged up at third. Sid [Bream] cut off the throw and then relayed it to me. In that two-tenths of a second, Caminiti smoked me. My right cleat stuck in the turf. It flipped me over. My leg was numb. The 1993 season saw Olson split catching duties with Damon Berryhill. Olson, who spent about a month on the disabled list, batted .225 in 83 games. The Braves won another division title but lost to the Phillies in the National League Championship Series. Olson’s first job following his playing career was managing. In 1994, Olson managed the Minneapolis Loons of the independent North Central League. The team included former Twins reliever Juan Berenguer. In 1995, the Loons moved to the independent Prairie League. Olson was able to convince the Braves to give a tryout to the Loons’ ace, Kerry Ligtenberg. The former Gopher, who was 12-1 with a 2.73 ERA, impressed the Braves, but they were reluctant to buy the contract of an independent-league player. Olson convinced the Braves to trade six dozen baseballs and several bats for Ligtenberg’s contract. In 1996, the Loons relocated to Austin, Minnesota, and became the Southern Minny Stars. In the fall of 1996, Olson got his real estate license. Olson has been selling real estate at Bearpath Golf & Country Club ever since. He and his wife, Lisa, have three children. Olson remains a baseball fan and in 2007 was able to watch three of his 1993 Braves teammates—Glavine, Smoltz, and Greg Maddux—pitch. That could turn out to be a defining moment for Olson’s son. Telephone interview with Greg Olson, 2008. Telephone interview with John Anderson, 2008. Interview (via e-mail) with George Thomas, 2008. 1989 Minnesota Twins media guide. 1993 Atlanta Braves media guide. 1980-1983, 2007 Minnesota Gophers baseball media guides. Baseball America 1984 Baseball Statistics Report. The History of Independent Baseball Leagues, 1993-2002, compiled by David Kemp and Miles Wolff. Bismarck, North Dakota: Mariah Press. Minneapolis Star Tribune clippings, 1990-1991.